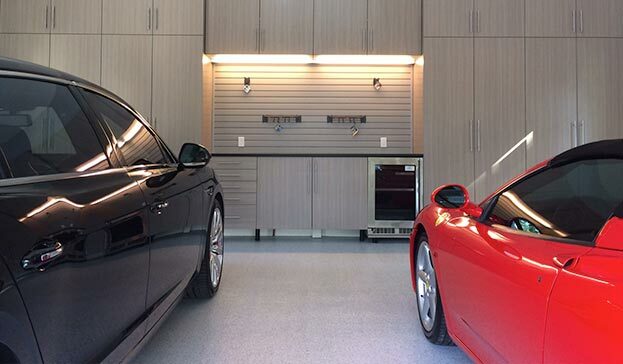 Prestige Garage specializes in garage, basement and storage renovation company. We do business in metro NY, NJ and Fairfield Counrty, CT. We provide top-quality epoxy floor coatings, cabinetry and organization systems. Ideal solutions for residential, commercial and business usage on concrete floors. As a concrete contractor, the Prestige Plus epoxy floor coatings are best used for garage, basement, utility storage, retail store, commercial kitchen and warehouse floors. Our epoxy flooring coatings can also be modified for a wide variety of commercial concrete installations and repairs. We also provide custom CAD design space solutions intended to improve the storage capacity of your garage, basement, storage or business spaces. Complete FREE Estimate Now Or CALL 877-823-5309. We offer a FREE site consultation and a FREE 3D design presentation tailored for your specific space. Our custom design is intended to WOW you with the liefstyle, aesthetic and organization benefits of our completed product. The 3-dimensional renderings bring you into the space, so you can visualize the space transformation prior to you making any decision. We seek to provide for the proper mix of cabinets storage, wall storage and organization options. Furthermore, we do additional value-added services to make the transformational process as seamless a possible like: move out/store/move in your belongings, painting, electric, lighting, vacuum, and motor lift systems. We also utilize ceiling storage systems, when additional storage spaces solutions are needed. We provide smart, clean and organized spaces!